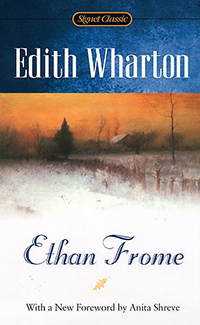 Ethan Frome, written in 1911 by Edith Wharton, came to my attention thanks to the Friendswood Library’s list of the top 150 English Language Novels of the 20th Century (http://www.friendswood.lib.tx.us/bookinfo/frpubtop150.htm). Wharton, a Pulitzer Prize winner, has written a number of well-known books and this story is one I had not heard of before. The story is about a New England farmer named Ethan Frome who is unhappily married to a wife with a miserable disposition. It is a sad story of the young man’s life of hardship in a desolate New England town. Edith Warton does a wonderful writing job by placing her story in a stark New England winter to set the mood in this tale. It is beautifully written and even though it is a short book, I found it quite moving. This book was written 100 years ago and has stood the test of time. I don’t want to tell too much of the story here believing it would ruin the ending for anyone who intends to read it. It surprised me! This entry was posted in Uncategorized and tagged Books, Edith Wharton, farming, New England, Pulitzer Prize. Bookmark the permalink.